Home Local Memphis Gathering in Memphis in Honor of Jesse H. Turner, Jr.
MEMPHIS, TN – Friends, relatives and business leaders gathered June 20 underneath a tent on the parking lot of the Tri-State Bank of Memphis in the Whitehaven community to pay tribute to the bank’s president for his decades of service. There was an intermittent drizzle and then a quick shower of rain at the most inopportune moment. But the inclement weather on that evening didn’t stop the retirement celebration for Jesse H. Turner Jr. The legacy began in 1946, the year A. Maceo Walker and his father, Dr. Joseph Edison Walker (founder of the Universal Life Insurance Co.), founded the bank to serve the financial needs of the African-American community. In 1949, Jesse H. Turner Sr., an ex-U.S. Army officer and CPA, was hired to balance the bank’s books. He would work his way through the ranks to become the bank’s president. During the 1950s and ’60s, when the civil rights movement was reaching a boiling point, bank officials reportedly kept the vault open one night to provide bail money for protesters. There were other incidents as well where the bank’s resources were doled out to support a cause or loaned to churches, organizations and black colleges. Community service was key to the bank’s legacy. After the death of the elder Turner in 1989, his son replaced him as president in 1990. He had been a board member since 1983, served as chairman from 1994 to 2011, and CEO from 1989 to 2016. He’s stepping down from the helm, but will remain on the board. “It was under Jesse’s leadership that this bank grew and prospered,” boasted William H. “Bill” Bufford, noting that Turner worked countless hours to steer the bank in the right direction. The daylight hours often spilled over into the night, Bufford and the others at the podium attested. It was customary, they said, to get a call from Turner with something on his mind that he needed to discuss. But that has been Turner’s modus operandi, each speaker noted. He is gentle, soft-spoken – as he is known – and to the point. So when Turner called after hours, the receiver would listen intently. Meanwhile, Turner continued to keep abreast of the latest trends in banking and sought to keep Tri-State Bank solvent. Unfortunately, time brings about a change and banking institutions often look for innovative ways to increase deposits. In January 2016, Tri-State Bank announced the sale of its headquarters, a 23,000-square-foot building at 180 South Main St., to Beltz Investco GP for $3 million. The deal included Beltz becoming a depositor and stockholder. 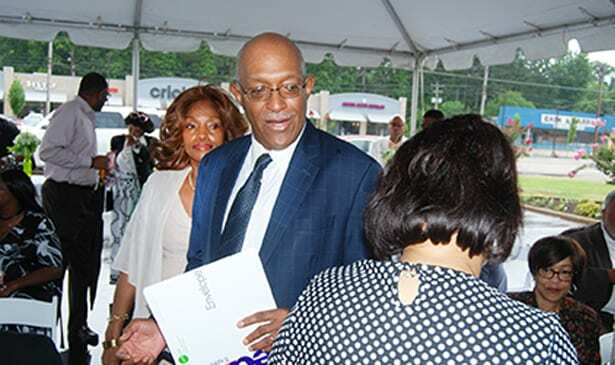 The infusion of funds and the repositioning of the bank’s operations, including the $1 million renovation of its Whitehaven location, helped to extend the life of the black-owned bank. Alden McDonald, president, CEO and founder of Liberty Bank & Trust in New Orleans, La., knows a lot about the banking industry and particularly the trials of black-owned banks. McDonald and Turner are friends. He, too, has survived periods of financial instability. “We’ve gone through some serious times – all of us,” he said, and urged the assembly to pass down the message that institutions like Tri-State Bank are important. Darrell K. Thomas, owner of Thomas Consultants, echoed McDonald’s sentiments. “Everyone has challenges, but this has been a great bank,” said Thomas, noting that he may be one of the bank’s largest depositors. Turner expects the next generation of bankers to grab hold of the legacy and steer the bank toward greater prosperity. “The final task of any generation is to hand the bank over to the next generation,” he said.